Do you want to sell more? Well, then you need a sales funnel. Businesses that started to use ClickFunnels as their sales funnel software reported a 41% increase in their sales revenue. Now, before you get all excited, you need to learn how to design a high-performance sales funnel. It will be a game changer for you and your business. This article will be the ultimate guide for you to learn how to use ClickFunnels and build amazing funnels for your business. If you’re not a tech-whiz, don’t panic. The best thing is that ClickFunnels is designed for people with little to no experience with funnels. Today I am about to introduce you to a fool-proof method that marketers and entrepreneurs use and generate millions of dollars in sales. Ever heard of ClickFunnels? It’s time to show you how this works! Here is what I’m going to be covering in this ultimate ClickFunnels review. Clickfunnels Facts: Did you know? Why all marketers need Clickfunnels? How to start making money with Clickfunnels? More than 60,000 entrepreneurs and businesses use Click Funnels. They have a community of over 150,000 people. ClickFunnels has created over a million sales funnels. ClickFunnels has donated nearly $100,000 to WTA for each sale funnel built. ClickFunnels has generated over 55,000,000 unique customer profiles (leads). It’s even more impressive when you consider that they’ve only been in the market for a few years. If this is how they’re getting started, imagine what it will be like in the years to come. As an expert marketer, I’ve made up to 5 figures without much effort with ClickFuneels for my clients. Now, if you’re waiting for the catch, sorry to disappoint. It’s all there is to the story. Clickfunnels offers a 14 days free no-obligations trial for you to try out their product. To make sure that you’ll be able to absorb and implement the content below, I strongly suggest that you click on this link and signup for the free trial. When I got my start, I wish there were software and a guide like this one to help me out. Before ClickFunnels, you had to know some HTML and most things weren’t automated. Let’s be honest, everyone would love to make money online. Now, before you convince yourself that it’s hard or not for you, think again. The truth is that making money online is a matter of knowing how to do it and not of hard work. With ClickFunnels, it’s all possible. When you have a higly-converting funnel, getting clients every day becomes the norm. Find out how this works in my clickfunnels review! As Gary Vaynerchuk always says, the secret to selling is caring about your audience before they care about you. In other words, this means caring about their needs, giving them what they want. Do this, and you’ll have unlimited advantage of your competition. What problems will my product or service solve? What makes your products or services different? Why they should choose you over your competitors? If you can answer these three simple questions then you only need a funnel and a proven strategy to reach your goals. It’s always good to find a model that works, instead of reinventing the wheel. See why ClickFunnels has fast become a market’s ultimate tool! Created in 2014 by Russell Brunson and his team, it’s become a 100 million dollar business that is a market funnel software for creating sales funnels with multiple added features to market and sell a wide range of products online. You can use it to make webinars, landing pages, membership sites, squeeze pages, etc. ClickFunnels was specifically designed to function as an all-in-one tool that caters to businesses and individuals that are looking to build sales funnels. Creating a landing page for your product, managing sales and other transactions and planning for events is now possible in a hassle-free way. Fact: More than 65,000 people on an average are using ClickFunnels at this very moment. Why is Clickfunnels different from other Page builders? ClickFunnels is making marketing secrets accessible for everybody. You have soccer moms, middle-aged man, and frat guy all building successful businesses and changing their lives. If you’ve been wanting to start a new business, don’t know what a funnel is or haven’t ever made a sale, ClickFunnels gives you all the tools, training and support to make your dream a reality without the need of employing a tech team. In a nutshell, ClickFunnels Gives You EVERYTHING You Need To Market, Sell, and Deliver Your Products and Services Online! You don’t have to buy a bunch of different third-party apps to create one funnel. You don’t need to hire 10 different people. 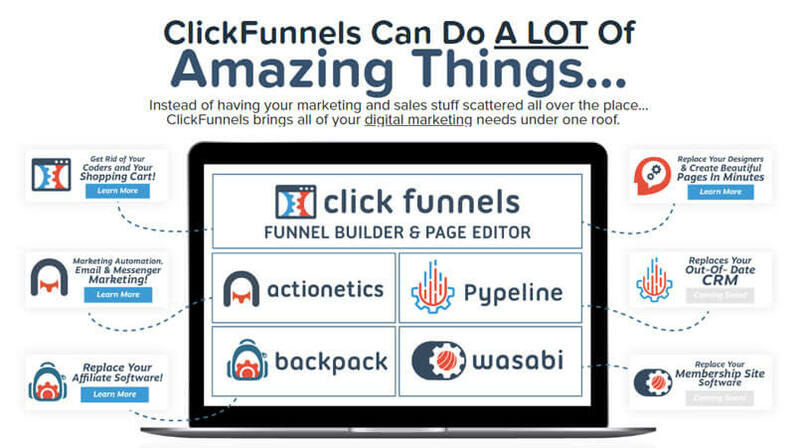 With ClickFunnels, you get everything in one place. It’s like going to the Amazon of page builders. Are you looking to start a business or break out on your own? Then the best software for the job is ClickFunnels. It offers you everything you need in one place without having to learn how to code, and advanced marketing techniques. 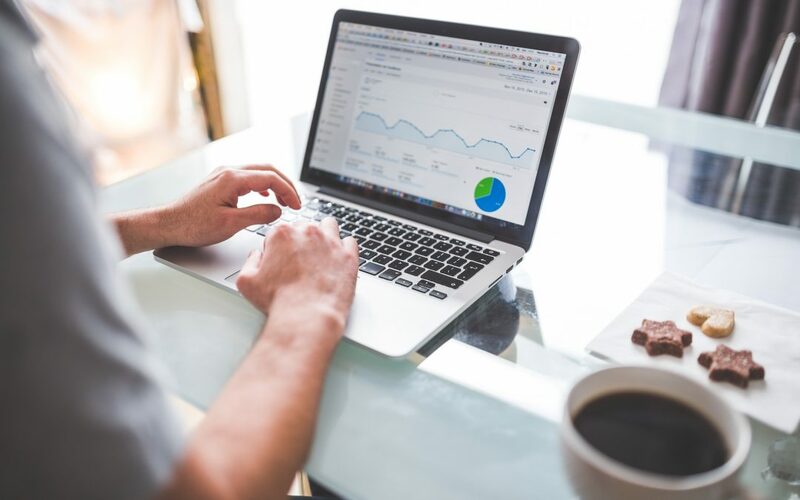 While ClickFunnels is offering ways to enhance your current marketing strategy, it also gives you the opportunity to enhance future skills via training. You are getting all the tools required to effectively promote and sell your product, from generating leads using ClickFunnels, hosting a webinar to increase engagement, building a funnel online, selling a product, sending mass mailers, and much more. Generating quality leads is easy if you use a lead generation website to bring more traffic to the page. As much as people say that you can generate a lot of organic traffic, and there’s some truth to that, you’ll still need paid traffic. You’ll send all that traffic to a website that is meant to collect details from customers. You’ll use this information to sell them your product, either online or offline. It’s easy to think that only online businesses are doing this. This is not the case at all. Many small businesses are generating leads such as in the construction and gardening niches. If you’ve been living on Earth for the past years, you know that people rarely have a landline. If you want to get in touch with potential customers, you need their email addresses. You’ll get this information when you have a sales funnel that works. ClickFunnels has many features, including audience segmentation. This means that you can change the message depending on the type of behaviour and individual preferences of the leads. This results in an optimized engagement. It also gives you the choice to link a sales page with multiple payment software options such as Stripe or PayPal. 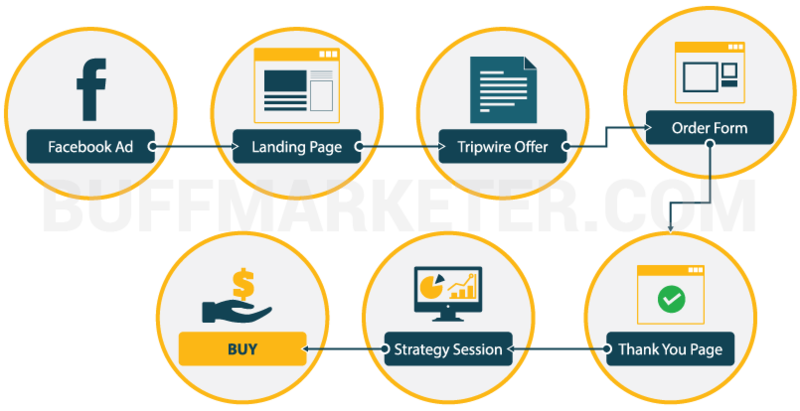 Marketing efforts are enhanced with simple yet effective features like running A/B tests of landing pages. Webinars are in the top 5 lead-generation techniques that marketers are using. The reason is simple. You provide a lot of upfront value in exchange for their email and their attention. If you’re new to the marketing game, let me tell you that attention is everything. There’s a reason big corporations are investing in more ads on Facebook and less on TV. Attention is money. So, if you’re not running a webinar, you should start now. So, if I’ve convinced you to run your first webinar, you can do so with the ClickFunnels webinar tool. All you need is a ClickFunnels account to get started. If you are using the software for the first time, select the 14-day free Clickfunnels trial to see how it works for your business. Go to the user dashboard and pick build funnel, to start the process. Then, select host webinar, “the Live Webinar” and name the funnel appropriately. You can tailor the page template in a few ways, such as the category for the webinar, set the timing and date, then update the page. It’s so easy that anyone can do it. If you still need ay help, you can get access to the ClickFunnels Facebook page and ask an incredible community to help you out. You can sell anything with ClickFunnels. Pick anything off the top of your hear, and I can assure you that you can sell it on ClickFunnels. For instance, digital products like music or games, has unique features that the platform lets you use to create a high-converting sales process. You can upload any digital files, create links and a solid mailer list to follow up with, and retain clients. If someone tells you something is perfect, you should be suspicious. Now, honestly, I didn’t find anything yet to complain about ClickFunnels. It offers al the features I need, in one place, and requires no previous knowledge of any tool. If it’s a physical product, the sales funnel building tool that ClickFunnels offers has convenient ways to help you plan the marketing strategy and make pages easy to navigate. To put it simply, you can just drag and drop the design without needing to know how to code. All the content marketing strategy that you’d have to know in other platforms, you don’t need it here. You can add multimedia elements like graphics or visuals to attract customers and help them contact you beyond the website. And the best thing is that is easy to do. Imagine that you want to share information with your customer base. You want to let them know the next product line that is about to drop, or you want them to get a saying on the design of the packaging. Whatever reason you have to want to have a virtual meeting to bring your customer closer to your company, you can do this with ClickFunnels. It’s so simple and easy that you may think it’s untrue. It isn’t. All you need to do is to set up a webinar (like I taught you earlier) and do your presentation. Before this, you would have to get a specific webinar service, pay hundreds of dollars for it, and manage a lot of things manually. Now, you can just click some buttons and have everything ready for you. 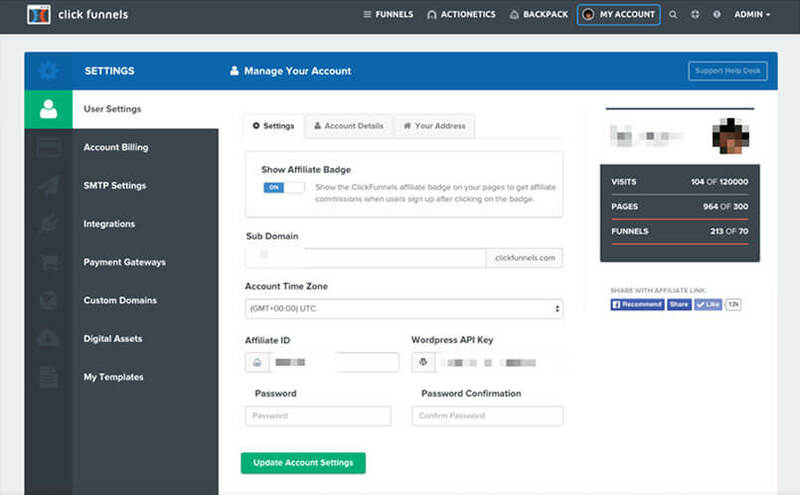 Clickfunnels is the perfect software to manage all of your automation requirements. Actionetics, a feature of the platform, is an accelerated email marketing tool that lets you maximise marketing outreach. It scans who your customer base is and pulls out relevant information about them to share customized product pitches with them. Not only does it help you send emails, Clickfunnels lets you promote products that your brand is affiliated with. Instead of having your marketing and sales stuff scattered all over the place. ClickFunnels brings all of your digital marketing needs and puts it together in one master marketing tool. If you have any experience with digital marketing, you’ll appreciate this. Imagine having everything you need in one place. You don’t have to keep track of dozens of platforms for everything that you have to do. You can have everything in one platform, and in one membership. Clickfunnels’ sales funnel software is changing the way people think about marketing. Whether you have a webinar, a digital product, a physical product or an online course, anything and everything can be sold through this one-of-a-kind platform. What is Clickfunnel marketing? 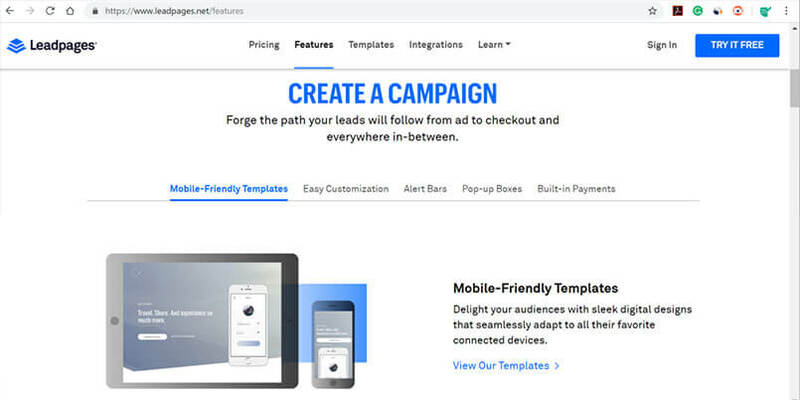 At heart, it’s a sales funnel builder and provides you with a vast array of templates and designed layouts to create landing pages similar to WordPress without having to bother with plugins. 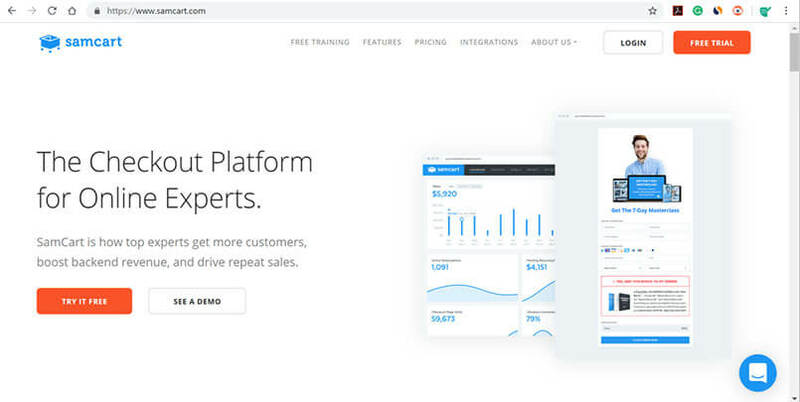 With a combination of quality software and education, Clickfunnels lets you choose to create opt-in sales pages, develop membership websites for an online event, sell products on subscription and lots more. ClickFunnels offers pretty much anything and everything that you’ll need to market a product online and make sales. The revolution that is creating is only the beginning. When you look at stats such as the millions of dollars in revenue and the 41% in sales revenue that the members are having, it’s easy to see why it’s such an incredible tool. Before you read any further you might want to go and read my full Funnel Hacking guide in which I have explained funnel hacking and how to funnel hack like a PRO. Click on the category most relevant to your business below to see case studies of people making hundreds and thousands of dollars with Clickfunnels [includes PROOF]. Russel Branson, the founder of Clickfunnels currently makes $17,947 PER DAY using Clickfunnels. Here is a video of him showing you how he does this [with proof]. If you don’t have a budget to start working with funnels, take advantage of the ClickFunnels Affiliate Bootcamp to gain an advantage over others. The training will teach step-by-step how to create funnels that actually convert. Figuring out what to do in the digital world can be intimidating. Many people who feel overwhelmed and don’t know how to deal with the extra information just give up too soon. If you don’t have your own unique products to sell, you can always start making money online by getting the ball rolling with ClickFunnels’ associated items such as the Expert Secrets book or the Dot Com Secrets book. No matter what you plan to sell, there’s a way to build useful funnels with this free sales funnel software. For instance, you can sell online books with a free + shipping label, which is hugely successful on the platform. In case it’s a workshop or webinar, you can charge a fee and utilize the lead-to-application-to-phone-call funnel. An on-demand skill, making funnels stand out requires patience and understanding of how back-end software works. You can become a ClickFunnels Certified Partner, and charge a fee to build memorable funnels. ClickFunnels has a builder and page editor that lets you customize each one for a tailored experience among key audiences. Each page can be developed by placing sections with varying columns and rows. You can also drag and drop elements using the mouse, to put them where they are needed. It is extremely intuitive and lets you add visual appeal to any page you choose. The seamless nature of adding and removing elements makes it optimal for both beginners and advanced users. While there are many complex CRM (customer relationship management) software in the market today, Pypeline simplifies things with AI intelligence that is pre-designed to detect when your audience has switched from a visitor to a buyer. You can see the diverse ways in which your audience interacts with funnels. This vital information allows you to improve the stages that you’re currently using to convert leads into customers. Imagine that a salesperson could read people’s mind to figure out what made them buy from them. This is pretty much what pypeline does for you. Backpack intends to make affiliate program creation a hassle-free experience. Its always been extremely time-consuming to create an affiliate team right from the custom code, the pages, the shopping carts, etc. After that you had to ensure that the 3rd party programs were linked to the product sales page, and hope for the best! An all-in-one solution, as seen by this clickfunnels backpack review, it lets you use pre-designed templates to conveniently add an affiliate program to any sales funnel. Coming shortly, this particular add-on lets you create good quality membership sites to get deeper insights into the type of audience. Wasabi provides you with a ton of templates (as many as 37) to work with in your business. A few of the categories include, but not limited to, Option pages, Presell pages, Sales pages, Thank you pages, Affiliate pages, and so on. You can pick any template in Wasabi, modify it however you want, and you are ready to sell. You can always start with the complimentary 14-day trial to see if this software is suitable for your business requirements. However, ClickFunnels has changed their pricing plans recently. In the early days, they had three separate pricing for plans but now it’s two. The cheapest click funnels price is at a decent $97 per month, which gives you access to every funnel creation tool but creation is limited. You can only make 20 funnels, have 20,000 visitors and 100 pages. On this plan, you will not enjoy access to Actionetics, the built-in email service provider and Backpack, which helps you to create your own affiliate program. For this additional access, you need to select the Etison Suite plan. Besides other benefits, you get unlimited funnels, pages, and visitors but the plan is quite expensive, at $297 a month. While there are no coupon codes available at this point, you can purchase Funnel Hacks for $997 which gives you 6 months of Etison Suite for free, with additional bonuses, cutting down the cost to $166.16 a month. ClickFunnels training and support has been great in my experience, but sometimes they can be slow to respond. If you make a request, a response is usually within a few hours and the staff are very friendly. A point to note is, the FB group for ClickFunnels is often faster in response time. Everything is in one place to take any e-commerce and affiliate business to the next level! I believe that Clickfunnels is great if you are finding ways to raise the average lifetime value of your client base. The interface is easy to navigate, and extensive features let you create customized landing pages and funnel marketing. You can find access to all the tools you’ll need and they’ll be easy to use. ClickFunnels will be with you in every step of the way. From getting your business known to making your first 1000 sales. You can use the training resource to increase the existing skills you have, along with the software. The trainings are motivating and great to complete. Clickfunnels’ community is also extremely supportive, and helps you with handy solutions to resolve issues easily. The trainings are easy to follow and will improve your marketing skills. Clickfunnels’ community is also extremely supportive, and helps you with handy solutions to resolve issues easily. People are often polite and take extra time to explain something to you. This is one of the main advantages of using ClickFunnels. We can talk about software features al day long, which are amazing. Don’t get me wrong. But if you ever tried to build an online business and failed, you know that the hard parts are the days that you doubt yourself, you don’t know if it’ll ever work, and you’re clueless on what to improve. The training and the community will get you through these days. Every time you think about quitting, you’ll get incentive from them. To truly reap the benefits of this remarkable system, one has to ultimately become a member. In terms of other things I don’t like, that the process of adding a funnel can be long and takes about 8-10 seconds each time. On the cheapest subscription plan, ClickFunnels limits your use to 20 funnels, 100 pages, and 20,000 visitors. This might be a problem for you if you are doing several projects at once or client work. The limited free trial is also not enough to get a better understanding of how the software might help you. Still, it’s worth the try. 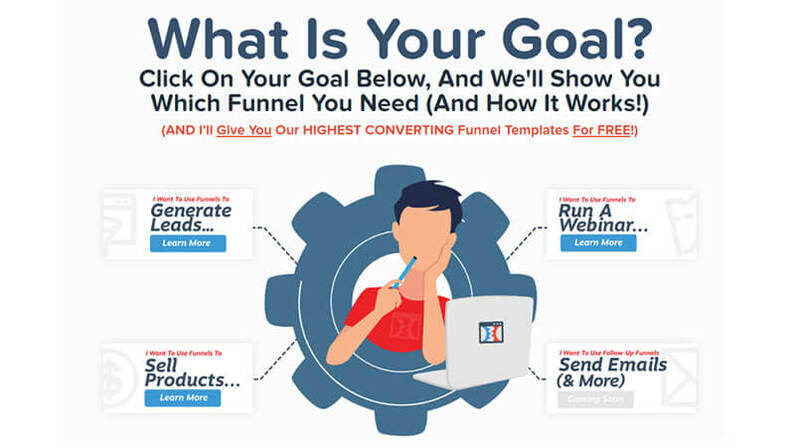 Imagine yourself building funnels that convert. Your whole business and life would change. That’s what ClickFunnels can do for you. So, I’ll bet it’s worth the shot. Overall, ClickFunnels is at the forefront when it comes to functionality and the absolute wealth of free and premium information. This marketing platform is also changing perceptions about using funnels to increase the value of any business opportunity. There are even freelancers and salespeople using it to get clients. So don’t think it’s just for businesses. If you are not sure about committing to this, grab the opportunity to complete the ClickFunnels 14-day free trial, and see if it will help you raise the profile of your business or product today. Some individuals or small business owners might find Clickfunnels to be complicated or out of their budget. If Clickfunnels doesn’t seem right for you, there are a few other click funnel alternatives in the market that might be worth exploring. They won’t give you the same benefits of having a lot of features, user’s experience, community, and training but they can certainly be effective. 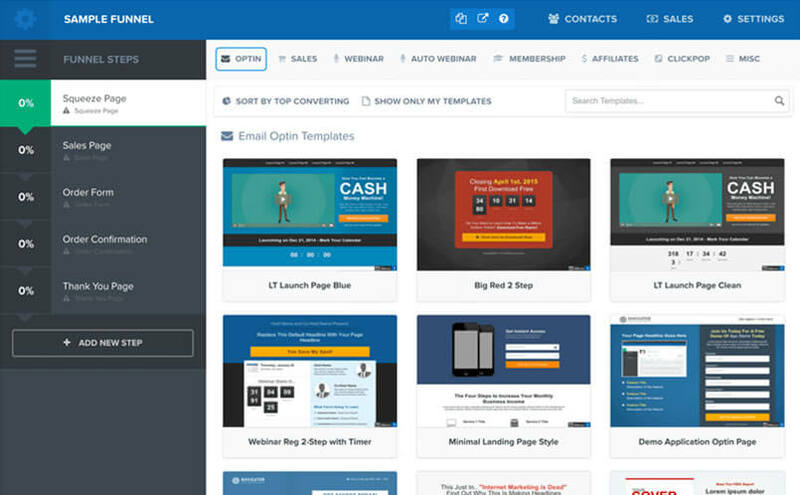 Leadpages offers something different compared to ClickFunnels, because it lets you optimize landing pages versus sales funnels. With more than 130 templates to start with, you can easily make unique landing pages that influence consumers. If you want a premium template, there is an option to purchase one from Themeforest at 10-30 dollars. Samcart isn’t based around landing pages but instead promotes a convenient shopping cart solution that is perfect for small businesses. For anybody looking to create a membership website, this is a great option to sell products such as eBooks and other digital downloads. In the market since 2009, this software has supported many customers that are keen on taking their landing pages to the next level, in an easy efficient way. With several customizable features that are catering to users, building and optimizing landing pages has never been more stress-free. 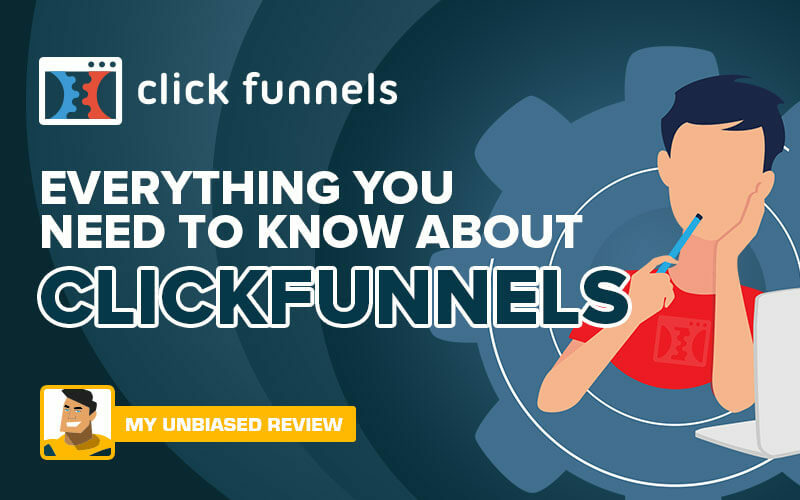 Hope I was able to cover everything you needed to know about Clickfunnels in this detailed review. I have also written a full step by step guide on how to Funnel Hack like a PRO please go and check it out. Did I miss out anything on Clickfunnels? Write in the comment section below and let me know. And as always if you find this post helpful please share it on social media and spread the knowledge. Thank you.